Habitat: Have a variety of habitats, but prefer rocky regions. They are also known to live in woodland areas, and have also been spotted residing in vacated buildings. Diet in the Wild: Omnivorous, including insects, small mammals, birds and reptiles, and fruits such as persimmons, hackberries and mistletoe. Physical Description: Adults are 14-16 inches long to the base of the long tail. Ringtails are agile, catlike animals with foxlike faces. The generic name means "little fox." The base color of its body is a buff white. The tail of this animal has alternating bands of buff white and black down its tail. The black rings on the tail are incomplete on the back side of the tail. They have curved, sharp partially retractile claws on the toes. The hindfeet can rotate to allow easy descent down tree trunks. Ringtails have about 40 teeth and 6 mammaries. They produce a variety of vocallizations from growls to chirps. Reproductive Behavior: Ringtails begin to exhibit sexual behavior at 13 weeks of age. Early spring is the beginning of their short breeding season. They attract potential mates through a high pitched barking call. The estimated gestational period for pregnant females is 45-50 days. The average litter consist of 3.3 young. The young begin reproduction the spring following their birth. The young are born with about 2-4 to a litter. They are covered by a white hair with their ears closed and tucked near their heads. Finally, at 4 months of age, they are indistinguishable from the adults, except for having a smaller size. 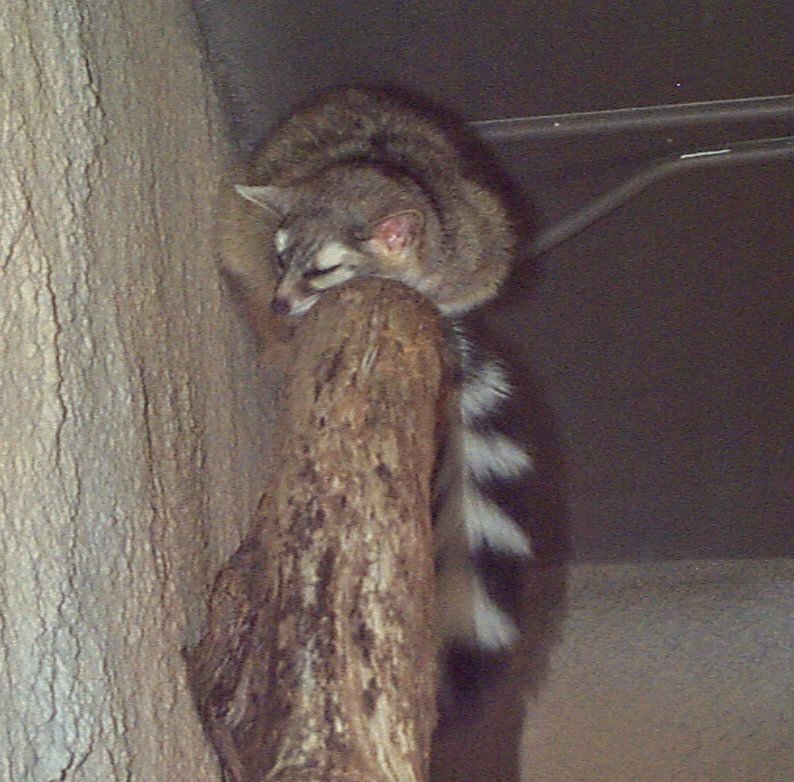 Special Adaptations: Since ringtails are nocturnal creatures, they have adapted to the "night life" through night vision. The eyes of nocturnal animals are usually large. This allows more retinal surface which allows the eye to collect more light. The retina of nocturnal animals is almost totally composed of rods, which are specialized for night vision. 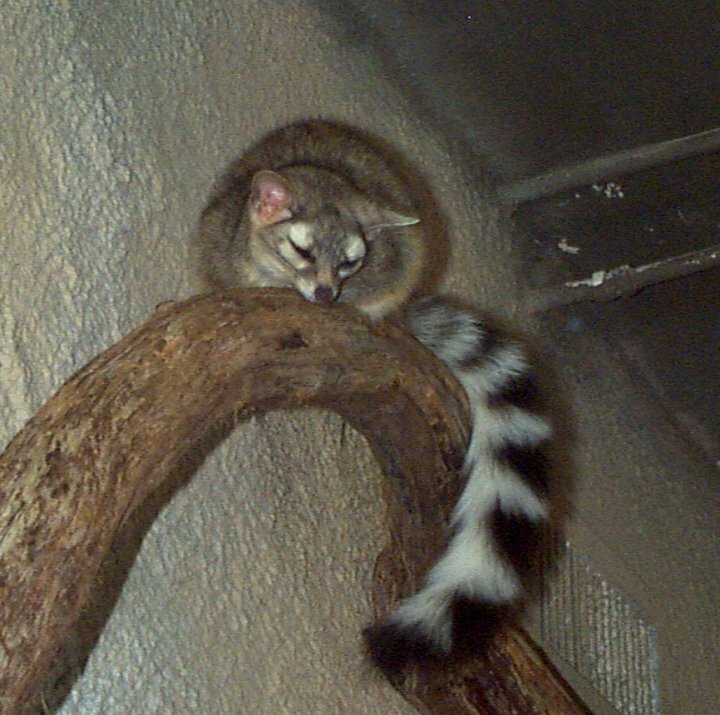 Ringtails also have red or yellow eyeshine. Eyeshine in nocturnal animals is due to light reflected from the tapetum lucidum, a reflective membrane below the retina. At the zoo, they are rarely seen awake in the daytime. Ringtails hunt at night, dispatching their small prey with a bite to the neck. Predators of ringtails include horned owls, bobcats, coyotes, and raccoons. Social Organization: Generally, adults den alone. Families are known to den within close vicinity to one another. The young stay with their mother until their first breeding season, then begin to den independently. "He who is cruel to animals becomes hard also in his dealings with men. We can judge the heart of a man by his treatment of animals."